Automatic cat doors are useful gimmicks if you want your cat to become an indoor and/or outdoor pet. It is scientifically proven that when cats have the freedom to roam the great outdoors, they are healthier and happier in safe environments and with proper care. In this article we review the SureFlap Dualscan. 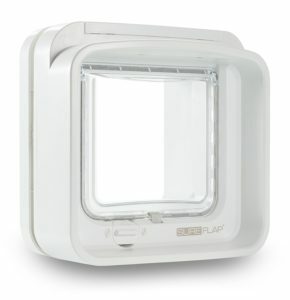 The SureFlap DualScan microchip cat door is an automatic pet door with an dual antenna. The antenna reads your cat’s unique ID microchip when exiting and entering the door. The chip operates as a key to unlock the program, and you can have it implanted under your cat’s skin. Or, if you do not wish to microchip your cat, it can be used in conjunction with a SureFlap RFID collar tag. If your cat has already been micro-chipped, the SureFlap DualScan works with most existing 9, 10 and 15 digit microchips. The only exceptions are those starting with 000, 010 and 020. The pet door’s internal memory can store as much as 32 microchip codes. 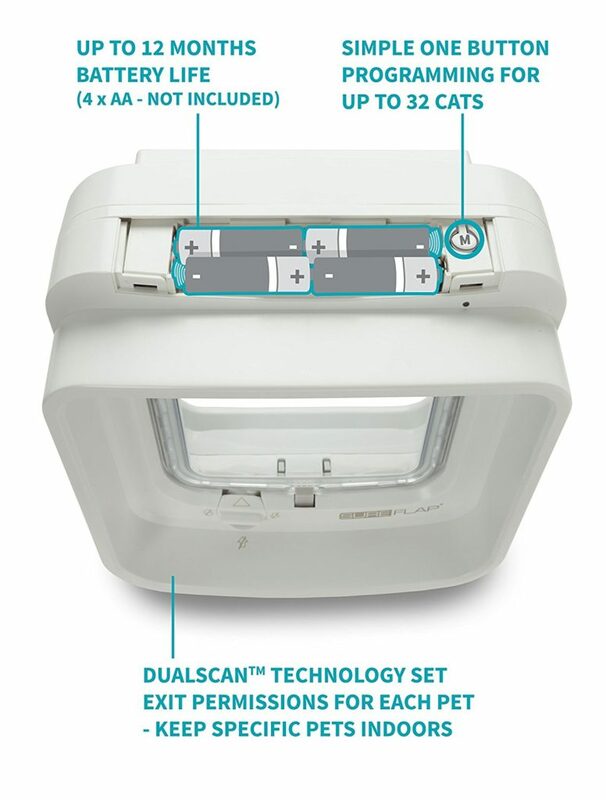 The SureFlap DualScan, with its selective entry and exit feature, is helpful if you need to limit a couple of your cats to indoor-only, while simultaneously allowing other cats to go out. The device will keep the neighbor’s cat from getting into your home. At the same time, you’re in a position to block the exit function to the cat you want to stay indoors. In order to let your cat remain inside, remove its specific ID number from the pre-programmed exit-allowed memory. Or perhaps, don’t microchip the cat. If your cat isn’t chipped, you can simply remove your pet’s RFID collar tags. The device comes with a 4-way manual lock, allowing any combination of in/out. The door has a strong magnet on the middle which stops it from flapping in the wind. The DualScan technology with twin antennas features selective entry and exit, allowing to keep indoor-only cats safely inside. Safety mode allows indoor-only cats to enter through the flap in the rare case they do escape through windows or doors left open. My cat Pushkin is very adept at escaping through open doors. Now I think of it, escaping cats are not rare at all. Will it keep unwanted pets or perhaps other animals from getting into your house, including raccoons? Yeah. It will prevent intruder animals entering your dwelling, that includes extra protection against cheeky raccoons. Will it work with your cat’s existing microchip? Probably. It is compatible with nearly all conventional 9, 10 or even fifteen digit microchips (except those starting with 000, 010 and 020). It works with RFID collar tags (not included, buy them separately here) if you don’t want to chip your cat. Simple programming of the flap by clicking a button; easy reprogramming allows you to change exit and entry permissions at any time. It provides you with the flexibility to manage your pets ability to get in/out according to your requirements. It features 4-way manual locking. By moving a control, you can put the door in Locked mode. This action shuts the pet door completely. The SureFlap DualScan may be implemented in doors, windows, and walls. Flap Opening Dimensions: 5.59? (W) x 4.72? (H) / 142mm (W) x 120mm (H) (This dimension is actually the smallest location of the cat door that your cat will have to enter). Hole Cutting Dimensions: 6.5? (W) x 6.73? (H) / 165mm (W) x 171mm (H) (The size of the gap had to place your cat door. Installation Template enables you to reduce the hole).? Tunnel Depth (outside): 2.75? / 70mm? Tunnel Thickness: 0.18 / 4.5mm? Tunnel’s Interior Dimensions: 5.9 (W) x 6.1 (H) / 150mm (W) x 155mm (H)? The microchip gets implanted under the cat’s skin. To get the cat’s implanted chip scanned, whether, from the inside or the outside of the SureFlap, the cat has to thrust its head in the tunnel/opening for the door to unlock. This means the microchip ideally has to be put on the cat’s back neck. If your cat was microchipped a fairly long time ago, you might have to determine if the chip hasn’t migrated further down its neck, because it may not do the job effectively if this occurs. If you are hesitant about microchipping your cat, simply place a chip on his/her collar instead. 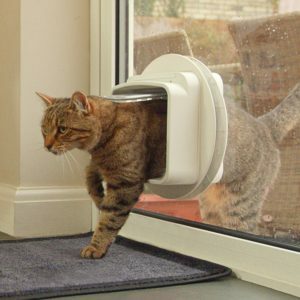 Now your kitty can use the automatic cat flap. You can buy these tags separately, and they’re affordable. How Does This Device Work? 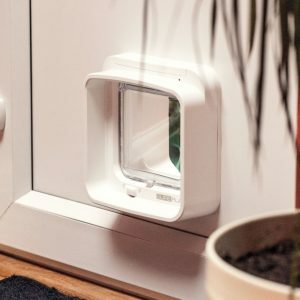 SureFlap DualScan operates with passive RFID technology, meaning a microchip implanted under the cat’s skin holds information that’s waiting to be scanned by a scanner on the cat door. The microchip itself doesn’t send this data to the scanner; it must be read by the scanner to unlock the flap mechanism. 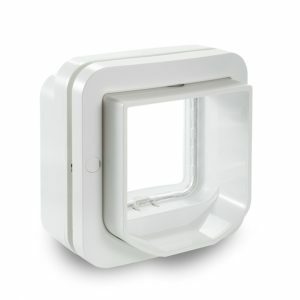 When your cat gets near the pet door, the scanner mounted in the DualScan’s tunnel reads the data stored in the microchip, recognizing the ID and unlocking the system. Next, the cat must push the door with its head or nose and move through. To get its microchip read, the cat has to put its head in the tunnel. After the cat has passed through the flap, a magnet located on the flap’s bottom part will help shut the door. The magnet will keep the door from not locking correctly and from flapping in the wind. The SureFlap DualScan has two antennas or scanners to check the microchip with: one scanner is placed on the inside of your home. The other one is placed on the outside. The inside and outside scanners can be programmed separately, which permits pet owners to decide which cats will be indoor/outdoor and which cats will be indoor-only. This device is the sole microchip cat door that enables you to program which cat can exit the door. Simultaneously, it provides you with the capability to prevent unwanted animals from getting into your house. Perhaps the most awesome feature of the SureFlap DualScan is its power to entirely block the malicious plans of raccoons to pull open the door from outside, which occurs, unfortunately, quite often with various other brands of cat flaps. This cat door features double locking technique, an outside catch outside will stop the raccoon from taking the door outwards, making it raccoon-proof. Precisely the same way, if you have smart cats in your neighborhood who figured out how to pull your cat doors wide open, this flap can remedy this issue too. The device has an emergency mode which allows your only-indoor cat to get into the door, in case you forgot to shut the windows or doors and your pet escaped through it. When the cat’s ID is programmed in to have enter and exit access, your cat is free to come and go at as he or she pleases. Your cat can easily get in, but it cannot get back out (set manually, by turning a dial). This setting comes in handy to keep outdoor and indoor cats at home at nighttime, or when you’re expecting a Vet visit. Using this mode, you have all cats inside without having to reprogram all ID’s.Additionally to the mechanical Only In function, you can electronically program the door for Only In for a cat of your choice, who you would like to be indoor-only. Either permanently, or just for a few days. Unlike the manual Only-In, which latches the door for everyone, the electronically programmed Only In stops only the inside cat from going out, while leaving the others free to exit the house when they want.You can do this by programming its microchip in Safety Learn Mode. To do this, push a button and make your indoor-only cat go through, so the mind learns its chip code. In Safety Learn Mode, the indoor cat will not be in a position to get out, but if the kitty escapes through a window, it’ll still have access to go back in through the pet door. Your cat could get out, but it cannot get back inside (latching the door by hand, by turning a dial). This enables you to maintain your cat outside in case you need. This particular setting isn’t used very often, but it might be helpful if you’ve visitors with a bad allergy to cats. Completely barred from both sides (manually by turning a control). In this mode, the door cannot be utilized at all by your cats. This setting is commonly used when leaving for a trip, or to lock in brilliant cats. To program the device, you have to press a button. This way it’ll go into Learn mode. Then you have to make your cat pass through to let the mind to retain the microchip ID. A pulsating light with a click sound suggests that the ID chip has been preserved. You can do this before the setup or perhaps after, but it’s far better to do it before to ensure that the microchip works. Programming in metal doors it’s a bit different. See the way to program a metal door here. The cat has to get used to the click sound when the door unlocks then push with its nose through. There are many methods for the cat to get used to the door’s tunnel and the unlocking sound. The noise is audible, but not intrusive. This device is actually among the quietest on the marketplace, but the cat still has to get used to it. On the other hand, it’s helpful to know when your cat is actually waiting to are available in or perhaps when leaving. Take the batteries out and make use of the door as a non-automatic one. Tape the door opened for several days and let your cat make use of it the way, so it’ll get used to the clicking noise as well as the tunnel, without the stress of having to drive the door. 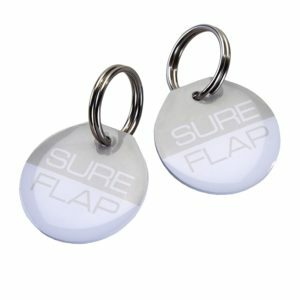 Get a SureFlap collar tag so that you can open the door yourself and promote the cat to pass through it. Install the cat door in a carton box first, and get your pet used to pass through it before you install it in the door or wall. You install the DualScan in a regular sized door (1.3/4″ thick), the tunnel created measures six inches at it’s narrowest, where the cat has to go through. This system comes with screw sets to make adjustments to the door’s depth so that it will fit in non-standard doors as well. How to Install The DualScan In Different Materials? Installing in wooden doors is simple. The cat flap system doesn’t demand any kind of adapters. You can easily install it with ease, with the items included when you purchase the device. There’s a good instructional video on youtube, showing you precisely how to install the SureFlap DualScan. Installing the Dualscan in metal doors or walls requires mounting adapters. You have to set up the flap with a Cat Door Mounting Adapter (product code GMA001) because metal interferes with the Radio Frequency control.Exactly how much the metal blocks the RF is determined by just how much steel is in the door. The more steel, the more the signal gets blocked. To setup the cat door in a glass door or window, you will need a SureFlap Cat Door Mounting Adapter. This adapter is a circular one, and it measures 11 inches. We suggest calling in a specialist in dealing with glass, also known as a glazier, to cut the gap in the door. This will help you to avoid any nasty accidents with glass. To install the DualScan in a wall, we suggest you get the Mounting Adapter (GMA001).You also want a SureFlap Cat Door Tunnel Extender (TUN001). 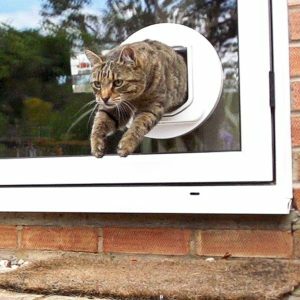 You might need one or even more SureFlap Cat Door Tunnel Extenders, based on the thickness of the wall. You’ll be adding approximately 4.25″ to the wall thickness. The batteries could last approximately from six months to a year, based on calculations for one cat. What quality of battery you use, and if they are rechargeable or not. If your cat likes to sit near the automatic door, unlocking it from the inside few times a day. No critters can go through the door from the outside if this happens. If you have a lot of unwanted visitors attempting to get through the door from outside. This way the motion sensor gets activated more. Keeping the automatic cat flap clean. If you make sure the flap isn’t obstructed by dirt of filth, your batteries last longer. What Are The Advantages and Disadvantages of the SureFlap DualScan Cat Door? Safety mode which enables you to keep your indoor cat in just (not permitted to exit), but if your pet escapes through the window, it’ll have the ability to get back in the building. You can decide per pet which cat will be inside and which one outdoors. It opens by scanning the unique cat’s programmed microchip code. Excellent option for cats that shed their collar often or perhaps cannot handle collars well. Good quality, sturdy, and well thought of design. You can use it as a regular, non-automatic cat door by getting rid of the batteries. This simple feature is desirable to train your cats in the beginning. A bit smaller than the typical cat door. A tall cat (measured by the height of its neck) or even a cat weighing over eleven pounds could have trouble getting through it. For a cat to use the door, it has to kind of squat down as it passes through. The door is 4.72″ in height. Most cats, in general, do not care about going through a narrowish hole, but several cats may not be used to it. There is a delay between the microchip getting read and the latch unlocking. This delay might be a source of stress if your cat is escaping from a perceived threat. The flap might not unlock if the microchip is too far down your cat’s neck. RF technology can mean issues with metal doors. Try and install it somewhere else, if you can. The scanner’s reading range outside differs than from inside. Make sure your pets can get through both ways. The soft clicking noise when the product unlocks might frighten some particularly scaredy cats. Keep in mind, all automatic cat doors make a clicking sound when they unfasten. The flap’s brush does not seal completely. It may let in some draft. The motion sensor doesn’t work well with cream colored cats. Screws do not have a great quality. Batteries last less with cats that love to sit down in front of the catflap window and stare at the great outdoors all day. The device doesn’t have a timer. When you change the batteries, do not take them out all at the same time. You might mess up the programming settings. Maintain the machine in a pristine, clean state; wash the bottom part of the frame, as well as the motion sensor, to make sure it is a proper operating condition. Before buying this unit, an excellent tip is to ensure to that you get the most recent SureFlap DualScan version. The manufacturer improved the unit’s design and its antenna function. 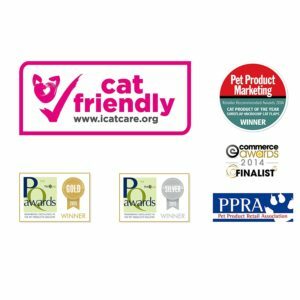 If you buy the SureFlap cat doors from the well-known retailer Amazon, the manufacturer guarantees you will receive the newest model of this particular device. Additionally, some individuals might have intruder problems with cheeky raccoons. As the mechanism locks both sides, it’s impossible for raccoons and other small animals (including cats) to pull the door open with their claws. Have cats that are an average to smaller size. Larger cats might need to get used to making themselves smaller. In the end, it will come down to your cat’s flexibility and willingness to go through a smaller hole. If you have a cat or perhaps kitten inside and another cat both in- and outdoors. If you wish to keep out raccoons. If the neighborhood cats come in your home to spray and eat your cat’s food. Old cats and cats with arthritis or disabilities impairing movement. « Why Does My Cat Pee or Poop Outside His Litterbox?